Let’s talk make up removal, do you use a product specifically to tackle make up? I don’t think a separate product for make up removal is strictly necessary depending on the cleanser you use, but at the same time I like to have something on hand that will blitz through make up without much fuss so I can then get on with using some of my more expensive and decadent cleansers on the skin. I recently saw a brand owner saying that people should use her cleanser to remove make up and when I saw the price I was horrified. A’kin cleansing micellar water (£12.50 for 150 ml) – This is a new release from A’kin, it arrived as a complete surprise with a couple of their other new releases and I was interested to give it a try. Micellar waters typically don’t get positive reviews on this blog, simply put, because I don’t often enjoy using them. I always have an issue with stinging, stickiness left on the skin or them simply not working well for me; but this product is the one that has changed my mind and made me give them another go. I really like the ingredients in this micellar, it has coconut water, green tea and cucumber fruit water, so it feels refreshing on the skin. It doesn’t leave a sticky residue at all and it does a fantastic job of removing make up, when I followed it up with a cleansing balm there was a small amount of residue left on the skin I had missed, but it really was a small amount. This is a really nice product for those hot days where you get home and want to take off your make up but aren’t yet ready to do a full cleanse routine. I have sometimes used it as a quick morning cleanse to freshen my skin when I have been running late and not managed my usual routine. It works well to get ride of any left over eye make up when your cleanser doesn’t do the job properly, there is nothing worse than leaving the shower with panda eyes still. I don’t think I would ever rely on micellar water as my only cleanser, but I am really impressed the formulation of this one from A’kin, it’s a brand that has some great products. 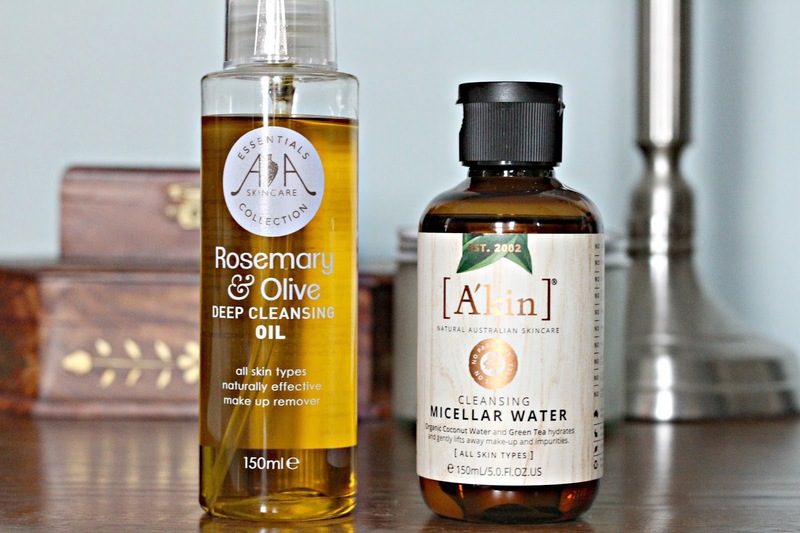 AA skincare Rosemary and Olive Deep cleansing oil (£7.98 for 150 ml) – AA Skincare are one of the best budget friendly skincare brands I have tried and this deep cleansing oil is my favourite product yet. This is a thick oil which comes in a pump bottle, I found a couple of pumps used for my whole face were enough and the oil emulsifies so can be removed with or without a cloth. It has a slight herbal scent from the Rosemary but mainly just smells of the Olive oil it contains, I know a lot of skins including mine will appreciate the fact that this isn’t heavily scented. The Deep cleansing oil is very similar to use as the cult DHC make up remover but at a fraction of the price. It takes off make up and sun cream with ease and leaves the skin calm, smooth and clean without feeling dry. This bottle lasts forever and the cleanser can be used to double or single cleanse, it doesn’t have to be used for make up removal, even though it does a brilliant job at it, if you wanted to use this as your only cleanser you could. My favourite aspect of this cleanser is without a doubt the fact that it emulsifies for easy removal, I know a lot of people find some natural cleansing oils too heavy without this feature. Two very nice cleansing options that won’t break the bank for you to try. What’s your favourite cleansing routine? Do you prefer a separate make up remover?